Can you imagine doing this job in sandals? 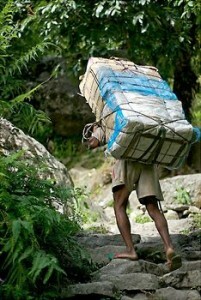 For many porters in rural Nepal, the cost of appropriate footwear is beyond their reach. Shoes for Sherpas provides “used but still usable” footwear to Nepali porters and villagers. To date, we have collected, inspected, transported, and fit 2,700 pairs of shoes to Nepal! The Sherpas are an ethnic group living primarily in the mountainous regions of eastern Nepal, and many make their living as porters in the tourism trade as well as in the day-to-day transport of goods from village to village. Since quality footwear is often either unavailable or unaffordable, our goal is to provide as much “used but still usable” footwear as possible to those living in the region. Shoes for Sherpas is a project of the Colorado Nepal Alliance, a 501(c)(3) nonprofit charitable organization. You can read a bit about the story of the Colorado Nepal Alliance and our projects on the About Us page. We’re more than just shoes! 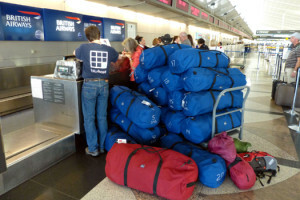 Bags of shoes at the start of their journey to Nepal. You can view pictures and dispatches from our past shoe distributions below, and we’ll be posting new reports from our Fall 2014 trip by late spring. Until then, start from the beginning with our first large-scale shoe distribution in the Everest Region in 2012. Or read about our multi-village shoe distribution in the Dhading District during June of 2013. We’ll be adding more about how we collect, inspect, transport, and distribute all these shoes in rural Nepal as soon as we can.